We loved this dish because it was full of flavor and leaned towards the healthy side with all the different vegetables incorporated into it. As you can see from the picture above, there are slices of Italian sausage that I served this with... because The Baron is very much a 'meat & potatoes' type of guy so I snuck in some meat on his plate lol. But this recipe is really adaptable. If your family must have some meat, add some Italian sausage or use your favorite meat sauce for the marinara sauce. This is a great dish for a freezer meal too. Prepare as directed and instead of putting it into the oven, wrap it up for the freezer. When you're ready for the dish, defrost and then pop it in a 450 degree oven, and bake uncovered for 30-35 minutes until warmed through and cheese is melted. 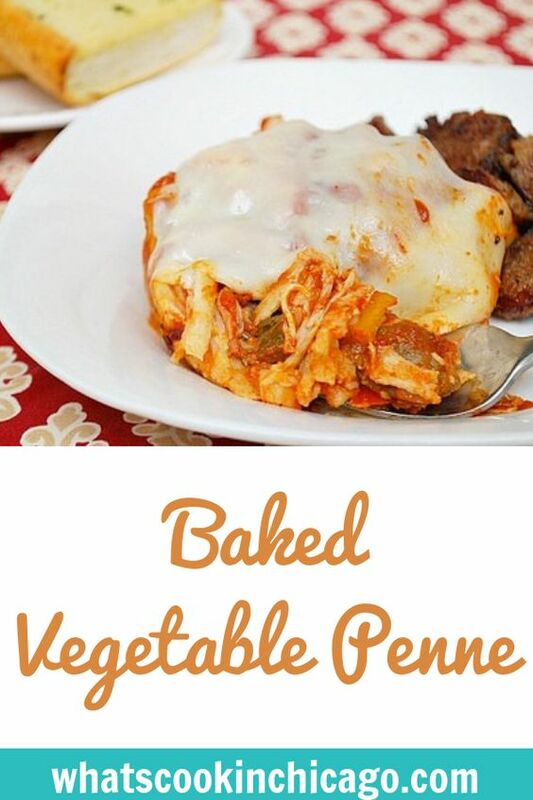 In a large bowl, toss the drained pasta with the roasted vegetables, marinara sauce, fontina cheese, 1/2 teaspoon salt, and 1/2 teaspoon pepper. Using a wooden spoon, gently mix, until all the pasta is coated with the sauce and the ingredients are combined. Pour the pasta into a greased 9 by 13-inch pan. Top with the remaining 1/3 cup Parmesan and Mozzarella slices. Bake until top is golden and cheese melts, about 25 minutes. We do meatless meals about half the week. The little guy seems to really enjoy them. Although he didn't have any issues devouring the Birria I made tonight. We actually had your baked penne (with sausage) this weekend and it was delicious.